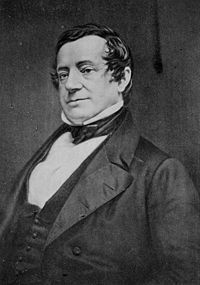 Washington Irving (April 3, 1783 – November 28, 1859) was an American author of the early nineteenth century. Best known for his short stories The Legend of Sleepy Hollow and Rip van Winkle (both of which appear in his book The Sketch Book of Geoffrey Crayon), he was also a prolific writer of essays, biographies, and other literary forms as well. He and James Fenimore Cooper were the first American writers to earn acclaim in Europe, and Irving is said to have mentored authors such as Nathaniel Hawthorne, Henry Wadsworth Longfellow, and Edgar Allan Poe. In the 1840s he served as the United States Ambassador to Spain. He is also known for speaking out against the unfair treatment of Native Americans. His famous home of Sunnyside just south of the Tappan Zee Bridge in Tarrytown, New York is still standing. The original house and the surrounding property were once owned by eighteenth-century colonialist Wolfert Acker, about whom Irving wrote his sketch Wolfert’s Roost (the name of the house). Irving’s famous home Sunnyside in Tarrytown, New York. Irving was born in Manhattan. Irving’s parents were William Irving of Shapinsay, in the Orkneys, a petty officer in the Royal Navy, and Sarah née Sanders. His first book was A History of New-York from the Beginning of the World to the End of the Dutch Dynasty, by Diedrich Knickerbocker (1809), a sly satire on self-important local history that brought “Knickerbocker” into the American lexicon, and then wider English usage. When he was 32 years old, Irving traveled to Europe. A lawyer, he was a member of the American diplomatic staff in Britain and in Spain. He spoke fluent Spanish, which served him well in his writings on that country, and he could read several other languages, including German and Dutch. He was a prolific essayist who wrote widely respected biographies of George Washington, the prophet Muhammad, and others, and he wrote a number of books on fifteenth-century Spain on subjects such as Christopher Columbus, the Moors, and the Alhambra. While in Europe, Irving dabbled in the theater, even serving as manager of the famed Globe Theatre for a period of time. In 1819 and 1820 he published The Sketch Book of Geoffrey Crayon, which includes his best known stories, The Legend of Sleepy Hollow and Rip van Winkle. During this stay in Europe he was a member of the American Legation to England but in his spare time he traveled to the continent and widely read Dutch and German folk tales. The pieces for The Sketch Book were originally written by Irving in Europe and were sent to his publishers in New York for publication in periodicals in the United States. While in England, his sketches were published in book form by British publishers without his permission and from then on he published in Europe and the U.S. concurrently to protect his copyright. Rip Van Winkle was written overnight while Irving was staying with his sister Sarah and her husband, Henry van Wart in Birmingham, England, a place that also inspired some of his other works. Bracebridge Hall or The Humorists, A Medley is based on Aston Hall there. Irving is also the author of The Adventures of Captain Bonneville and Astoria and used firsthand accounts of these American west journeys, although most readers continue to believe they are "embellished" history. We send our youth abroad to grow luxurious and effeminate in Europe; it appears to me, that a previous tour on the prairies would be more likely to produce that manliness, simplicity, and self-dependence, most in unison with our political institutions. His second Western book was Astoria; he wrote it during a six-month stay with the then-retired John Jacob Astor. It was a worshipful account of Astor’s attempt to establish a fur trading colony at present-day Astoria, Oregon. During Irving’s stay with Astor, Benjamin Bonneville paid a visit. His tales of his three years in Oregon Country were said to have enthralled Irving. A month or two later, when Irving encountered Bonneville in Washington, D.C., Bonneville, struggling to write about his journey, decided instead to sell his maps and notes to Irving for $1,000. Irving used that material as the basis for his 1837 book The Adventures of Captain Bonneville, which is often considered the best of his three Western books. In the 1840s, he returned to Europe as the American ambassador to Spain. 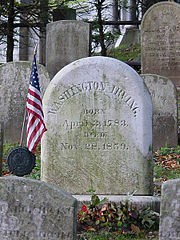 Irving’s grave, marked by a flag, in Sleepy Hollow Cemetery, Sleepy Hollow, New York. Irving popularized the nickname "Gotham" for New York City, later used in Batman comics and movies, and is credited with inventing the expression "the Almighty dollar." His name also appeared as an alias for forgers in Joseph Heller’s classic novel Catch 22 along with its inversion, Irving Washington and that of the author John Milton. Irving’s name appears across the country. The village of Irvington, New York, and the town of Irvington, New Jersey, were named after the author, and also, it is believed, the city of Irving, Texas. Both Washington Street and Irving Street in Birmingham, Alabama, also bear the author’s name. His book Bracebridge Hall was the inspiration for the naming of the town of Bracebridge, Ontario. In addition, a library in Los Angeles, California, is named in his honor. Irving Avenue in Port Chester, N.Y., is named after him, as is a condominium townhouse community along this road called Washington Mews, which was built during the 1980s. Washington Irving Memorial Park and Arboretum in Bixby, Oklahoma also bears his name. In Spain, the room at which he stayed in the Alhambra is labeled and referred to as his room and there is a hotel named for him just outside the Alhambra. 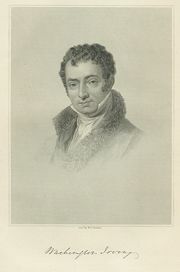 The southern-most section of Lexington Avenue in New York City (between 14th and 20th streets) is named Irving Place, named so after Washington Irving in 1833. A house that stands on the corner of 17th Street and Irving Place is said to have been the one time home of Washington Irving, however that claim seems to have been only a myth. Across the street from this house is the Washington Irving High School (New York City). On the corner of 16th Street and 3rd Avenue (one block east of Irving Place), is the Washington Irving House apartment building. ↑ Christopher Gray, "The Washington Irving House; Why the Legend of Irving Place Is but a Myth," The New York Times, March 13, 1994. All links retrieved April 22, 2014.